Castration is one of the most common surgical procedures we perform. Castration is a service we can offer at the clinic or on your yard if you have a clean stable, good lighting and a supply of clean water. Castrations cannot be done on a Zone Visit. Castration can take place at any age, providing that both testicles have dropped into the scrotum. If only one testicle has descended this is known as a rig, it will require a general anaesthetic and possibly a prolonged surgery to remove the retained testicle. Castration of stallions (3 years and over), Miniatures, Shetlands and Donkeys are best performed at our clinic; please ask one our vets for further details. This would apply if your colt is under 3 years old. Most colts can be castrated whilst standing under sedation with the use of local anaesthetic and a tool called an ‘emasculator’. Once both testicles are removed, the incisions are left open to drain to avoid swelling and infection. 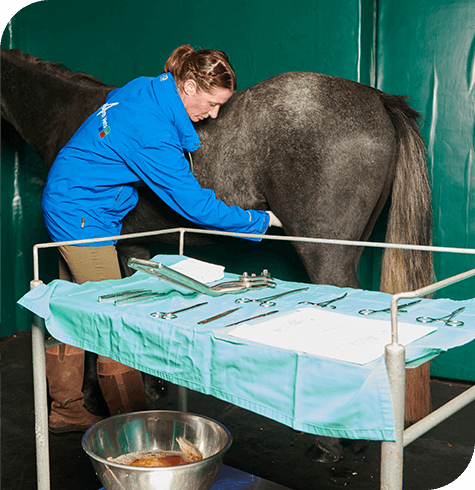 We suggest any stallions (3 years or over), Miniatures & Shetlands be brought into the practice as they may require a castration under a general anaesthetic; the risk and benefits will be discussed with you by one of our vets. The techniques can be open or closed castration and we may employ a device called a Henderson’s castration tool. Your horse should be stabled for 12-24 hours so that the wound is kept clean and you can monitor for any bleeding, swelling or signs of infection. Depending on the technique used and how the procedure progressed you may be given some antibiotics and/or anti-inflammatories to administer. Your horse may then go on the horse walker or in the field which allows movement and should reduce any swelling; once the wound is fully healed the horse may return to normal work. If you are concerned about any of the issues below, we recommend you ring the practice to speak to one of our vets. There will be some blood spotting due to the wound being left to drain; this should be no more than a large drip a second. The scrotal area and preputial sheath will be slightly swollen; excessive swelling may be abnormal. Any thick or discoloured liquid coming from the wound is abnormal. A small amount of pink or red tissue may protrude from the wound in the days following castration; this should be no more than a couple of centimetres and not unusual in appearance. Keep an eye on his behaviour e.g. quiet, not eating or drinking.